Lyme Disease UK has created an awareness pack specifically designed for children of various ages. Parents, schools and hobby/special interest groups can use this. Lyme disease is a rising issue in the UK. It is important to be properly informed, particularly when there is a lot of misinformation and misconceptions about the illness. Lyme disease is predominantly caught from the bite of an infected tick. Whilst the UK countryside is some of the safest in the world, tick bites are probably the highest risk we face when outdoors, in terms of likelihood and impact. Ticks can be as small as a poppy seed and have a painless bite, so they are often missed. Firstly, it is very important to be aware of tick bite prevention methods to protect yourself and children you are responsible for when out and about. We have created a downloadable ‘Wake Up to Lyme’ awareness pack which includes posters and leaflets. Awareness material can be placed around the buildings you use and sent to parents/carers. If you would like to enquire about co-branded leaflets please contact us. 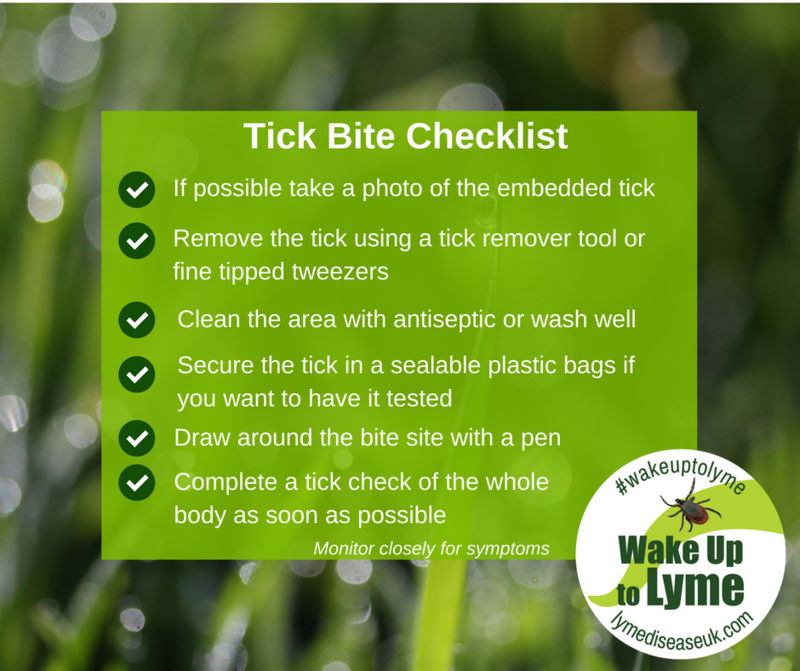 We have created a downloadable checklist that can be used as part of a Lyme disease risk assessment for any excursions. We have created a letter template to be sent to a child’s parents who has been bitten by a tick. We have created a letter template to be sent to children’s parents if a child in the group has been bitten by a tick. We have created a letter template for parents to send to teachers if their child has been bitten by a tick at school. Watch our free webinar training session on Lyme disease awareness. We hope it will be a valuable resource to any individuals or organisations wishing to learn more about the illness and the preventative steps which can be taken. A resource pack which accompanies the webinar can be found here. Secondly, children can actively help to to educate the whole family on the dangers of ticks and therefore help keep everyone safe over the summer holidays, as well as during the rest of the year. We have created a choice of presentations and activities that can be used in a variety of ways by parents, educators and group leaders. The winners will be announced on our website and receive a prize and their posters will be shared on social media and used as part of our awareness campaign. Deadline: Friday 19th July 2019. One poster per school, per category please. The posters will be shared on social media and the winner will be announced on our website and their poster used as part of our awareness campaign. If you have any questions and would like more awareness materials, contact us.